The renowned Irish novelist, screenwriter and dramatist Roddy Doyle has been busy fostering the talent of aspiring teenage authors. As part of the “Fighting Words” programme, Roddy and his team have helped 25 Transition Year students from CBC Monkstown Park write, edit, develop and launch a book of their short stories entitled “Brain Storms” that will now be available nationwide! CBC Monkstown was the only school selected in the country to be involved with this project this year! Founded in 2009, Fighting Words believes that creative writing is an essential part of every child's education. They wanted to provide a free dedicated opportunity to let children explore the vast potential of their imagination and as a result inspire self-expression, literacy and self-confidence in young people. The Transition Year students of CBC Monkstown Park were the lucky participants of a unique year long programme run by Fighting Words which offered them a weekly space to come and write short stories in the presence of the volunteer writing team. Each week they worked on creating, developing and enhancing their individual short stories with the view to putting them together as a collection. "This is a fantastic collection and it's one to be savoured – don't gorge on all the stories at once. Spread them out over a long while, like delicacies. I think we'll be hearing from many of these new voices again and again and again." CBC STUDENTS HEADING IN TO SEE THEIR BOOK BEING PRINTED! FRESH PRINTED PAGES OF BRAIN STORMS! JACK, PAUL ,SHANE, BRIAN AND GREGG SEEING THEIR BOOK BEING PRINTED! FRESH OFF THE PRESS IT'S BRAIN STORMS! This game is inspired by the Father Ted episode "Flight into Terror" where the priests are trapped on a plane and they have only two parachutes to get people off the plane. In order to decide who will get them, Ted asks all the others to write a speech about why they should the parachute. Essentially, you are getting the students to recreate this situation. This debate is primarily about develop the skill of making arguments in favour of a motion or an idea. It is particularly useful as grounds them in the real world (by getting them to advocate for a real person or thing) before they end up debating more abstract ideas. · This is best used as a prepared exercise. Tell students a few days in advance that they will be speaking, so they can research their speech properly. This game works best with four or five students. · Explain to the students that they are to imagine they are on a plane full of famous figures from history. The plane will soon crash and there is only one parachute available. 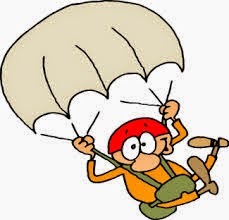 · Students are to imagine that they are any person from history and they have to write a speech (2 to 3 minutes) explaining why they should get the parachute. 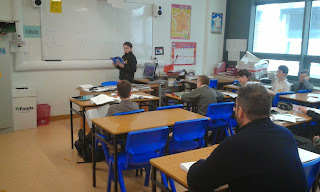 · Students then deliver their speeches to the whole group and the group votes for who they think should the parachute after they have all spoken. After you've done the above exercise with students, there are a number of ways that you expand it to use it in the future as students become more confident and skilled. · "I deserve it more than them" - after they've all spoken, get each of the speakers to explain why they should get the parachute over the other people. They must make reference to what other speakers have said and explain why their historic figure is more important than the others. This helps students work on their rebuttal. · Narrow the focus. Tell the students they have to pick someone from a particular category like sports stars or American presidents or Irish independence leaders etc. This allows for greater comparative arguments between the speakers. · Make it a life raft. Change the imaginary scenario to one where students have to advocate for the inclusion of something on to the last life raft which is leaving for humanity's new home. They have to argue for the importance of things like subjects in school, scientific inventions, films, sport teams and so on. · Use it in the classroom. This game can be used across the school to get students to engage in various aspects of subjects they are being taught: students arguing which character is most important is whatever play they are studying in English, which scientist has had the biggest impact on life through their work in science, what city students would want to live in geography and so on. 2. "I couldn't disagree more"
This is great little activity to get students into the debating mood at the start of a training session or a fun way to wrap up a session at the end. It is intended to get them to work on their rebuttal skills and also gets them up and thinking on their feet, which is important for them which they are offered points of information during debates. · This is a game for everyone in the group. · The students all stand in a circle. 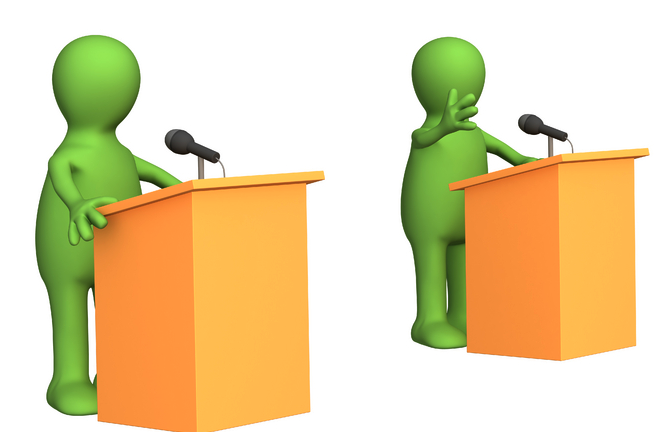 · The first speaker speaks for one minute in favour of a particular idea or motion. · The next speaker has to immediately respond by saying "I couldn't disagree more....." and explaining why they disagree with what the speaker before them has just said and, if necessary, giving a new argument for their side. · Each speakers goes in turn around the circle. They all must speak for a minute and they cannot repeat an argument that has been made before them. If they break either of these rules, they have to sit down. · The game continues until there is only one student left standing. · Rather than going around the circle to each student in turn, get the students to pass a ball around the circle, which means that they won't be able to predict when their turn will come so they have remain engaged throughout the whole exercise. "If I ruled the world!" On Thursday April 30th my class headed to the DLR LexiCon Library for a tour. When we got there we were greeted by Marian Keyes, a librarian, she showed us all around the library, she showed all the different levels in the library and different areas, such as the study areas and meeting rooms. There was also a stage area with seating for 101 people, a cafe and an outdoor area. Marian told us that they are going to be getting a 3D printer in the library along with a number of Apple Mac computers for use in the library. She also showed us how to take books out using a machine that scans a sticker on the inside of the book. You can also drop books back by scanning them and placing them on a converter belt that sorts them into boxes. All in all it was a very interesting and informative tour and I hope we can go back there soon. Written by Harry Loakman 2nd Yr.
"Last Friday roles were switched when some of our first year French students got to see what a lesson is like for a teacher and vice versa. 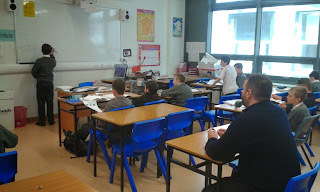 The first year class were asked to look over phrases that they had learned over the year with a view to teaching Mr Fitzmaurice the basics he would need for a trip to France. Prior to the lesson students had a brainstorming session to decide what expressions would be the most useful. On the day, the boys were keen to present different phrases, and helped each other out when there was confusion. The new teachers got to show off what they had learned in the course of the year but also had to react to the needs of their student, focusing on pronunciation and dealing with questions on unprepared sentences. Mr Fitzmaurice was an enthusiastic learner and was eager to use and practise the vocabulary covered by engaging in model conversations with his teachers. Every student got the chance to contribute and were made aware of how much they had learned over the year. 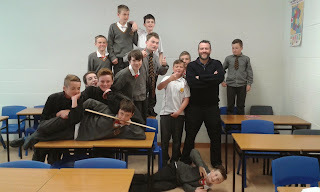 This was a focused, positive class experience and gave the students the chance to try out a different role in the classroom while revising key material. Thanks very much to Mr Fitzmaurice for coming in!" First Years Busy teaching French! Today Dara Keenan took time out of his busy Leaving cert schedule to come into our class in 5th year English and provide us with his knowledge of the language of persuasion. Dara is a very successful debater and has lots of experience with using the language of persuasion when debating on behalf of the school at a very high level. Dara was able to give us some useful tips for our leaving cert on how to write a speech. Some of these tips included the structure of the speech, using anecdotes and how to make certain things sound better than they are which my whole class found very helpful! Dara was able to go through every aspect of the speech making sure we could pick up the most points possible which I was very thankful for. I learned a lot from what Dara said, the speech and persuasive language questions seem that much easier to approach now. Dara grabbed the classes’ attention right from the start, everyone felt he was a great speaker and would love to hear more from him. I think the whole class came out of it having gained new knowledge on the language of persuasion. I felt it was a very good experience learning from other students and learning about their view and opinions on certain subjects. MR. DARA KEENAN TEACHING THE LANGUAGE OF PERSUASION! 5TH YEARS BUSY TAKING DOWN KEY POINTS! Welcome to the Learning Revolution at CBC Monkstown Park. We are a collective of teachers who share ideas and are always exploring new ways of learning to become better educators. We value cross collaboration within school, between schools and with people who want to see the best for our students going forward. We are educators and designers and we wish to create dynamic learning spaces so that all members of our school community cherish a love of learning. So lets get talking and make great change happen!